Las Vegas, United States－Janerary 9th, 2019－Thermaltake, the leading PC DIY premium brand for Cooling , Gaming Gear and Enthusiast Memory solutions, is proud to announce the Thermaltake Level 20 Tempered Glass Edition Full Tower Chassis received the 2019 CES Innovation Award. The Level 20 received recognition in the Computer Hardware and Components Category from a panel of 89 judges. The judges consist of renowned consumer technology designers, engineers and members of the press. Evaluation is based upon engineering qualities, aesthetic design qualities, product influence/value, novel features, and the product’s competitiveness. 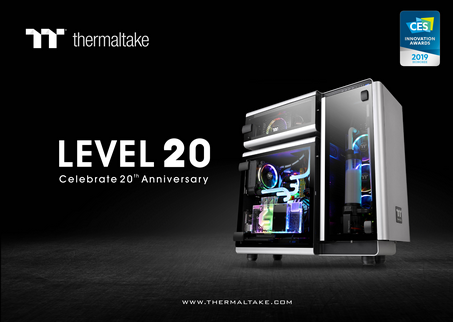 Thermaltake achieved several breakthroughs in terms of design and technology of the Level 20. Featuring a gaming oriented design with architectural aesthetics, the aluminum-made Level 20, utilizes an aerodynamic trio chamber structure to achieve ventilation and space management optimization. The three hinged swing-doors are made with premium-quality 4mm thick tempered glass windows that provide durability and superb viewing capability. The Level 20 is installed with latest USB 3.1 Type-C port to provide 10 GB/s of transmission speed. Furthermore, the three built in Riing Plus 14 RGB Fans, two Lumi Plus LED Strips and one Riing Plus Digital Controller can all be controlled with the TT RGB PLUS Software. Users can custom control fan speeds and lighting effects to create their own unique liquid cooling gaming system. Compatible with the latest PC hardware, AIO and DIY liquid cooling solutions, the commemorative Level 20 Full Tower Chassis delivers not just an unprecedented design but also innovative performance. To witness the award winning Level 20 firsthand, please visit us at the Venetian Hotel Veronese 2402 Suite. To continue achieving the corporate mission of delivering the perfect user experience, Thermaltake developed “TT Premium” with the essence of combining supreme quality products with a new logo design. TT Premium is far more than just a guarantee of quality. Behind the name, it represents the passion in DIY, Modding and Thermaltake’s desire to be the most innovative brand in the PC hardware market. To satisfy the demand of the high-end PC users, TT Premium follows its core values of Excellent Quality, Unique Design, Diverse Combinations and Boundless Creativity to provide a high-performance PC product for every enthusiast. Thermaltake has been evolving continuously over the past two decades in the PC DIY industry. From developing thermal ventilation optimization, gaming-oriented design to architectural aesthetics, we never stop striving to provide the best to the consumers. Thermaltake, while constantly improves on the PC hardware components, also always advocate for the Modding community. We understand the importance of appreciating innovation and maker movement, so we continually support and work with modders to advance the PC DIY industry together. To help us celebrate our 20th anniversary and reflect on our achievements, we gathered all the successful elements on what we have learned over the past two decades and combined with the latest trends in the market to form Level 20. Monitor the fan performance, adjust the fan speeds, and customize the lighting effects for Thermaltake RGB PLUS series products with the patented TT RGB PLUS Software and exclusively designed mobile app. Talking to TT RGB PLUS App is an easier, faster way to control your system lights. You can ask it to turn the lights on or off, switch lights modes, dim the lights, change light colors, or adjust lights speeds or fan speeds. All Thermaltake TT RGB PLUS products are able to connect into the Razer Chroma ecosystem. Users who have installed both the TT RGB PLUS Software and Razer Synapse 3 can experience synchronized gaming and RGB lighting effects on their TT RGB PLUS liquid cooling system and gaming gear! From cool down timers, health bars, and flashy ultimate indicators, to subtle ambient lighting that sets the perfect mood for each game, Razer Chroma provides an experience that transcends the screen and into your full setup, for a truly immersive experience. All Thermaltake TT RGB PLUS products support Amazon Alexa Voice Service, allowing you to control the lights or fan speeds by talking to the Alexa-enabled device. With the support of the Amazon Alexa, TT RGB PLUS products also offer an additional visual cue for checking current weather condition in your location or anywhere in the world. All you have to do is simply start the sentence with “Alexa, tell Thermaltake”, then the color of the lights will correspond to the weather condition in the location. 3 Riing Plus 14 RGB Fans and 2 Lumi Plus LED Strips are built in to enhance the ventilation and light up the Level 20 with 16.8million distinctively gorgeous illuminating display colors. Both can be controlled by the patented TT RGB PLUS software through the included Digital Lighting Controller. Level 20 utilizes the trio chamber design to achieve ventilation and space management optimization. By separating PSU, Motherboard, and Storage/LCS into different compartments, Level 20 creates an organized space that can be viewed through the high quality tempered glass windows. Level 20 supports both vertical and horizontal PSU orientations, allowing versatile placement options. The PSU chamber features aluminum mesh panel to ensure thorough airflow and ventilation of the PSU. Level 20 assures exceptional expandability, the motherboard chamber can support up to E-ATX motherboard and 360mm radiator as well as 3 x 120 or 2 x 140 mm fans. The motherboard chamber can also institute riser cable or AIO liquid cooling systems. In the spirit of encouraging innovation and flexibility, Level 20’s third chamber is capable of instituting powerful data management or liquid-cooling solution system. The tempered glass door is perfect for showcasing components while the aluminum mesh panel ensures supreme airflow. The Level 20 features aluminum panels created by high precision CNC digital cutting to ensure chassis security while providing futuristic gaming essence. The aluminum anodizing process establishes water and corrosion resistant panels. The aluminum casing utilizes CNC milling technology, and was sandblasted to construct elegant and sleek curves. Three hinged swing-doors made with premium-quality 4mm thick tempered glass guarantee window durability and viewing capability. The included Thermaltake TT Gaming PCI-E 3.0 Riser Cable comes with premium quality, ultra-high speed cable and EMI shielding with conducting polymer to exceed user expectation. Users are allowed to choose the way they want to display graphics card or install the power supply vertically for ultimate system display. Entailed with detailed functionality and immense storage with up to 11 drive locations for 3.5” or 2.5” devices; including 6 at the back of the motherboard chamber, 2 in front of the motherboard chamber, and 3 in the LCS chamber. The Level 20 also supports up to E-ATX motherboards, comes with cooling fitment for CPU coolers up to 200mm in height, VGA lengths up to 310mm and PSU sizes up to 220mm in length. The Level 20 enables users to build extreme air/liquid cooling systems with high-end, large graphics cards and incomparable storage. Constructed with individual chambers and aluminum mesh panels, along with three preinstalled 140mm Riing Plus LED RGB fans, the Level 20 provides efficient heat source is dissipation and perfect airflow modulation. Moreover, the isolation of high capacity radiators and fans allows for additional interior space without compromising the cooling performance. Thermaltake has no hesitation when it comes to pursuing the latest trends in the industry that can improve our products. The Level 20 is installed with the USB Type-C™ I/O port to provide 10G of transmission speed by each port. USB 3.0 I/O ports are also included. User can freely build the system from the ground up with given modular panels, racks, brackets, and pre-design mounting arrays. No more unreachable screw corners or gaps, and enjoy easy installation with the Dismantlable Modular Design.